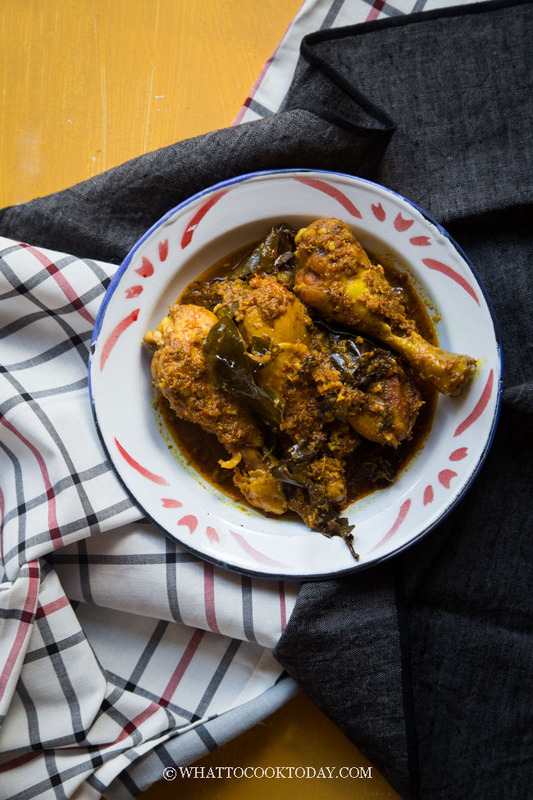 Ayam Kalio (Indonesian Wet Chicken Rendang)- Chicken is cooked in aromatic spices, herbs almost similar to the famous classic Indonesian dry rendang, but kalio has more of the delicious wet sauce. Almost everybody knows about Indonesian famous rendang Padang, which is cooked until it’s dry and barely any sauce there. 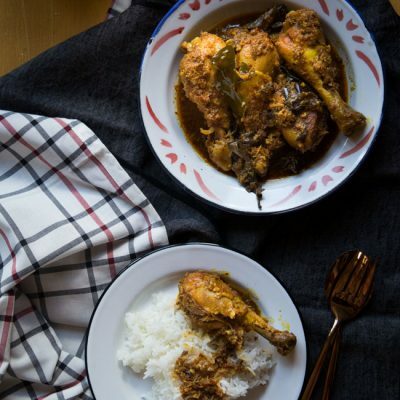 Kalio is the opposite of rendang. I call it wet rendang. Both are originated from Minangkabau. Despite being a wet rendang, it doesn’t mean that it’s soupy either. Kalio is somewhere between gulai and rendang, with gulai being a soup like and rendang being dry. 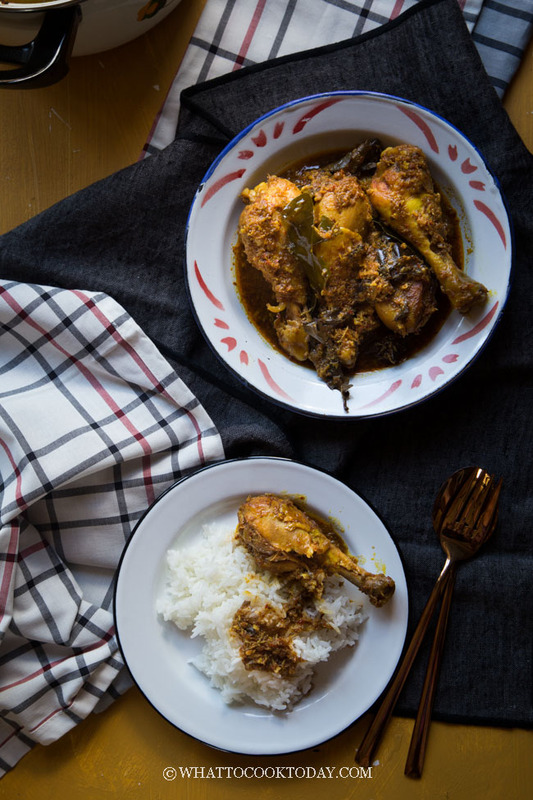 Whether it’s a gulai, kalio, or rendang, all these three aren’t curries. They are being loosely translated as curries by many, but they aren’t, at least not to the local people. 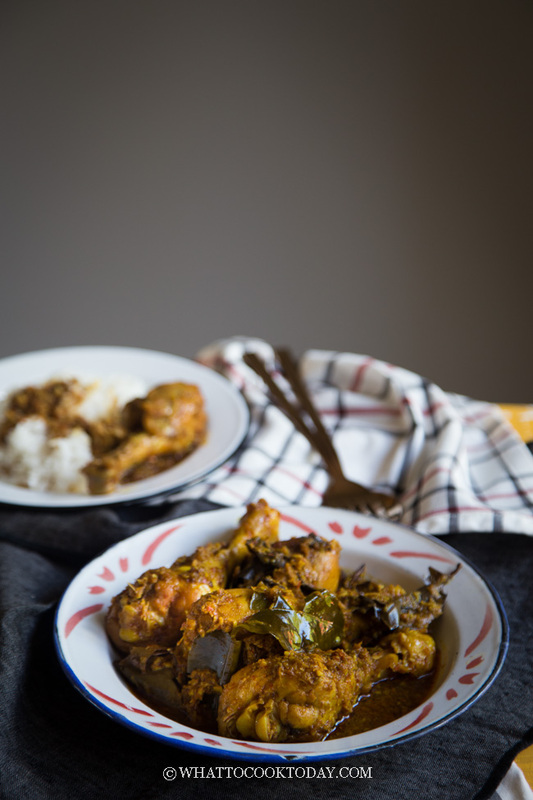 Kalio is so tasty because of the contribution of all the spices and herbs used in the recipe. Most of the ingredients can be found in major grocery stores. Kaffir lime leaves are only available in Asian store and the leaves contribute significant aroma to the dish that I would not omit if you ask me, but if you have never tasted kalio or rendang before, I guess you won’t really “know” 🙂 I used lots of powdered spices because they are convenient and widely available these days. 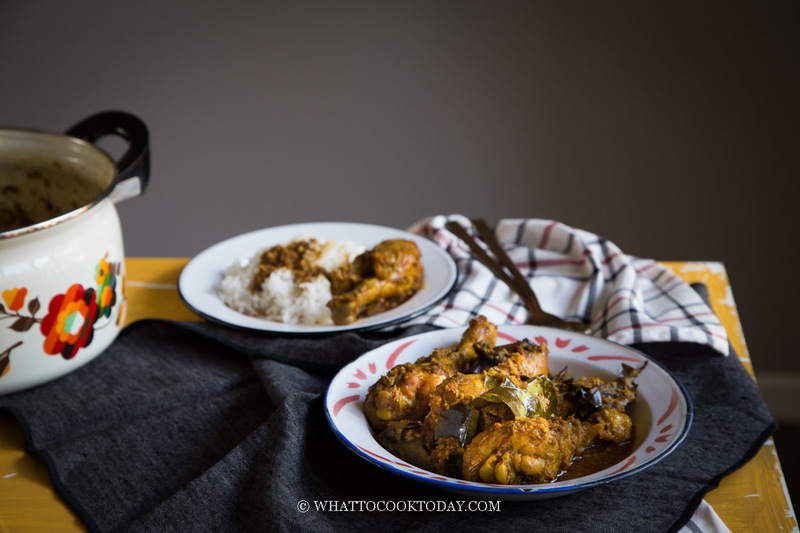 I did not use coconut milk in this ayam kalio recipe. It’s really up to you if you want to or not. Traditionally, coconut milk is added so the color of the finished dish will also look more like bright orange or yellowish. 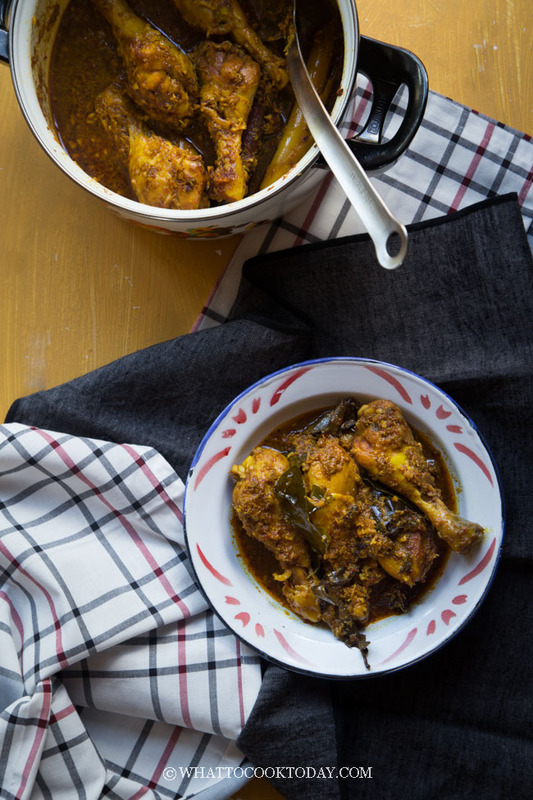 The process of making kalio is similar to rendang, only that kalio takes shorter time to cook because the coconut milk is not cooked until it evaporates completely and left with coconut oil in rendang. 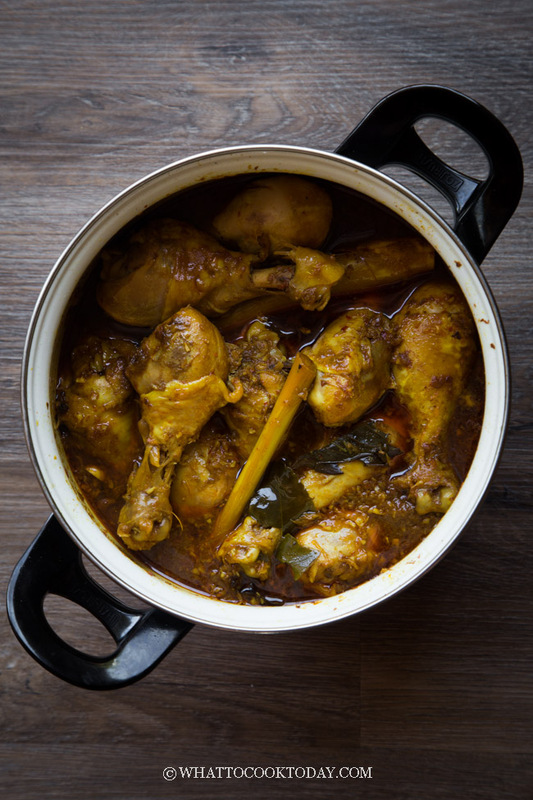 Kalio is only cooked until the chicken is cooked through and the coconut milk is slightly reduced so you still end up with thick sauce. The flavor is even better the next day. Leftover can be kept in the refrigerator for up to 3-4 days. They can simply be reheated on the stove-top. You can also portion this out and freeze the chicken along with the sauce. Just to warn you though, the texture of the meat might not be as moist the longer you freeze them. Tried to consume within a month. Let it thaw in the refrigerator before reheat. 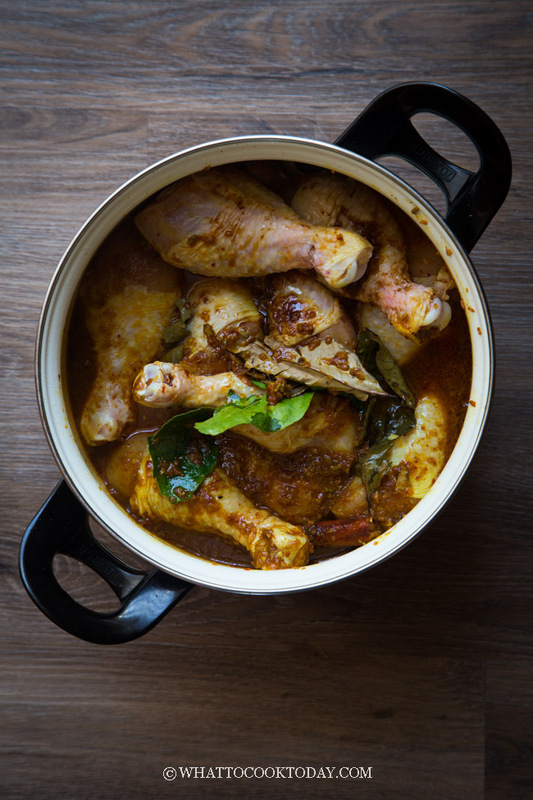 Chicken is cooked with aromatic spices, herbs almost similar to the famous classic Indonesian dry rendang, but kalio has more of the delicious wet sauce.